Chair of Nominating and Corporate Governance Committee, and member of Executive Committee and. Quality, Compliance and Ethics Committee. Mr. Kerrey has been president of New School University in New York City since January 2001. Prior to becoming president of New School University, he served as a U.S. Senator from the State of Nebraska from 1989 to 2000. 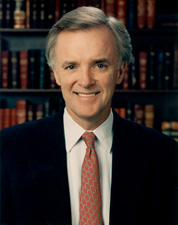 Before his election to the U.S. Senate, Mr. Kerrey was Governor of the State of Nebraska from 1982 to 1987. Prior to entering public service, he founded and operated a chain of restaurants and health clubs. Mr. Kerrey holds a degree in pharmacy from the University of Nebraska. He is a director of three other public companies, Genworth Financial, Inc., Jones Apparel Group, Inc. and Scientific Games Corporation. He is also a director of the Concord Coalition. Mr. Kerrey has been a director since March 2001. A Senator from Nebraska; born in Lincoln, Lancaster County, Nebraska, August 27, 1943; attended the Lincoln Public schools; graduated from the University of Nebraska, Lincoln 1966; served in the United States Navy SEAL special forces unit, 1966-1969; wounded in Vietnam and awarded the Congressional Medal of Honor for conspicuous gallantry and intrepidity at the risk of his life; operated a chain of restaurants and fitness centers 1972-1982; Governor of Nebraska 1983-1987; elected as a Democrat to the United States Senate in 1988; reelected in 1994, and served from January 3, 1989, to January 3, 2001; was not a candidate for reelection in 2000; chairman, Democratic Senatorial Campaign Committee (One Hundred Fourth Congress); president, New School University 2001; member, National Commission on Terrorist Attacks upon the United States (9-11 Commission) 2003-2004. James Q Crowe Former CEO; Level 3 Communications, Inc.